When the holidays beckon, it’s the most wonderful time of the year to be a musician. It’s even better to be in the audience at the Grand Rapids Pops. The weather outside wasn’t frightful, but the music sure was delightful for the Grand Rapids Symphony to open the Wolverine Worldwide Holiday Pops in gaily decorated DeVos Performance Hall on Thursday, Dec. 1. The sounds of the season filled the program with favorite carols, popular melodies, and music from movies, music from ballet and much more. Though it began with a whisper with guest vocalist Justin Hopkins singing “O Come All Ye Faithful” alone, without accompaniment, it ended with a roar of the orchestra, the chorus and many in the audience of 1,700 singing the “Hallelujah” Chorus from Handel’s Messiah. 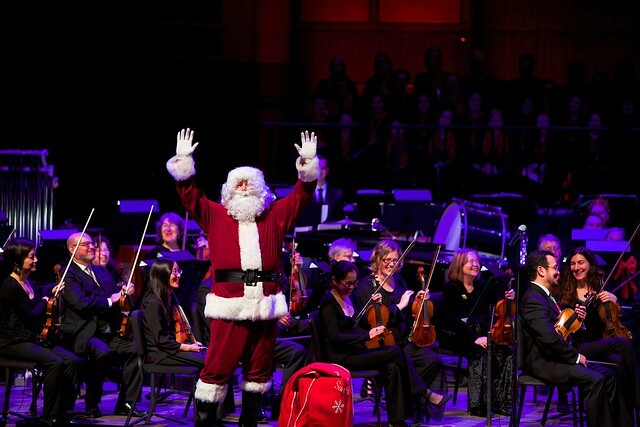 Principal Pops Conductor Bob Bernhardt, wisecracking all the way, was on the podium for his second Holiday Pops with the Grand Rapids Symphony and the Fox Motors Pops series. The show repeats at 8 p.m. Friday and Saturday, December 2-3, with matinees at 3 p.m. Saturday, Dec. 3 and Sunday, December 4. Tickets start at $18 adults, and they’re disappearing fast. The extraordinary Justin Hopkins, who last year was in New England for the Boston Pops Happy Holidays Show, made his first appearance with the Grand Rapids Symphony. In fact, the Philadelphia native said it was his first-ever visit to Michigan. But the showstopper was Hopkins, in his booming bass-baritone, singing “You’re a Mean One, Mr. Grinch.” In the original, menacing key, as Bernhardt happily told the audience. It’s a feat not many can pull off, but Hopkins did so brilliantly. Still, it takes a community to make the Wolverine Worldwide Pops. In addition to the Grand Rapids Symphony, the orchestra was joined by Grand Rapids Symphony Chorus and Grand Rapids Youth Chorus plus Embellish Handbell Ensemble – several hundred musicians in all. Something old and something new filled the 90-minute show, not including intermission. Soothing music such as J.S. Bach’s “Jesu, Joy of Man’s Desiring” featuring the polished Grand Rapids Symphony Chorus. The vocal ensemble directed by Pearl Shangkuan also joined Bernhardt and the orchestra for John Williams’ “Merry Christmas” from the 1992 Macaulay Culkin movie Home Alone 2, and for Alan Silvestri’s “Spirit of the Season” from The Polar Express, the 2004 Tom Hanks film based on the picture book by Grand Rapids’ own Chris Van Allsburg. Naturally, Santa Claus himself stopped by for a visit. A little tradition came from music including Leroy Anderson's perennially popular “Sleigh Ride,” with principal trumpeter Charley Lea as the voice of the bobtailed bay. The Grand Rapids Symphony masterfully played off three favorites from Tchaikovsky’s The Nutcracker, featuring principal harpist Elizabeth Colpean with the enchanting harp cadenza leading into the “Waltz of the Flowers.” Next week, the Grand Rapids Symphony joins Grand Rapids Ballet for full-scale productions of the favorite holiday ballet opening Friday, December 9. Christmas isn’t Christmas without the sound of bells, and Grand Rapids is graced with some of the best. Nearly no one was silent for the Christmas Carol Sing Along. The Wolverine Worldwide Holiday Pops wouldn’t be the same without it.